But, what protects the emergency responders? How do fire fighters and other first responders ensure they’re not exposed to the same hazardous substances? A decontamination zone with showers is essential at an incident involving harmful chemicals, explains Hughes Safety Showers. Portable decontamination showers offer the simplest solution for decontamination, the company adds. Deployed in under a minute, its PORTAflex 300-16e decontamination shower provides emergency relief for casualties and allows emergency responders to wash hazardous materials off their protective clothing before removal. 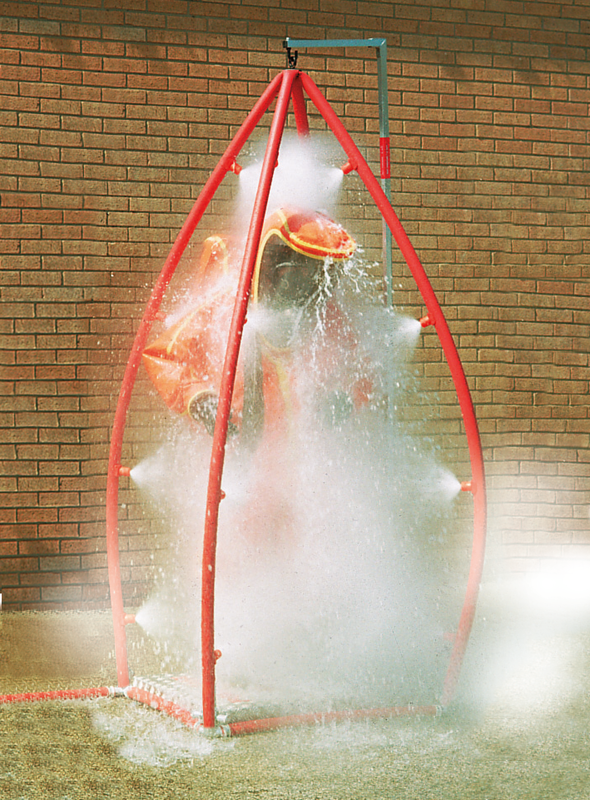 The triangular shape of the three hose legs ensures 360-degree decontamination. The legs also become rigid under pressure to supply the 16 nozzles with water. The carrying case is compact and rugged, whilst doubling as a base platform on assembly. The PORTAflex CUPOLA inflatable shelter, provides for the containment of contaminated water. The simplest models feature an entrance opening on the “dirty” side and an exit door on the “clean” side. Replaceable inner linings with windows enable observation of the casualty during the decontamination process. The Cupola shelter has an inflatable frame for easy assembly.